As severe weather and more frequent natural disasters affect cities in the United States and around the globe, many of us are looking to invest in a more resilient future. Cities are often grappling with two-directional flooding challenges as they face gradual sea level rise or more frequent flooding of rivers, and localized flash-flooding due to erratic weather patterns, rapid urbanization, and increasingly impervious surfaces. One need only look at the challenges Houston faced during and after Hurricane Harvey last year to see how these individual elements conspire together to wreak havoc. So what do we do about it? While there is no “silver bullet” that will reverse the effects of climate change, designers can help plan ahead for handling more water in our cities by working with private and public land-holders who promote more sustainable design and development. Large land-owners in urban environments, such as colleges and universities, working hand-in-hand with municipal partners, are uniquely positioned to lead the way in reducing their contribution to flash flood events by exploring creative ways of handling stormwater onsite. The traditional civil engineering approach—which most cities and universities still employ—conveys stormwater from paved surfaces directly into storm drains, carrying it offsite as quickly as possible. This approach, while expedient, only exacerbates flash flooding downstream in the watershed, affecting lower-lying (and often lower-income) neighbors and causing erosion and pollution of local waterways. The time has come to buck or, at the very least, supplement that tradition. Through our work with a number of forward-looking urban universities, we are taking innovative approaches to stormwater management that take some of the pressure off existing systems, while offering several added benefits. Through employing these new strategies, we are helping our clients prepare their campuses to handle increased volumes of water while also positioning them as responsible stewards of their watersheds. We promote systems that manage stormwater through an integrated approach—minimizing the stress of water on our systems by incorporating a mix of elements such as bioswales, porous pavements, green roofs, subsurface water storage, and floodplain greenways. 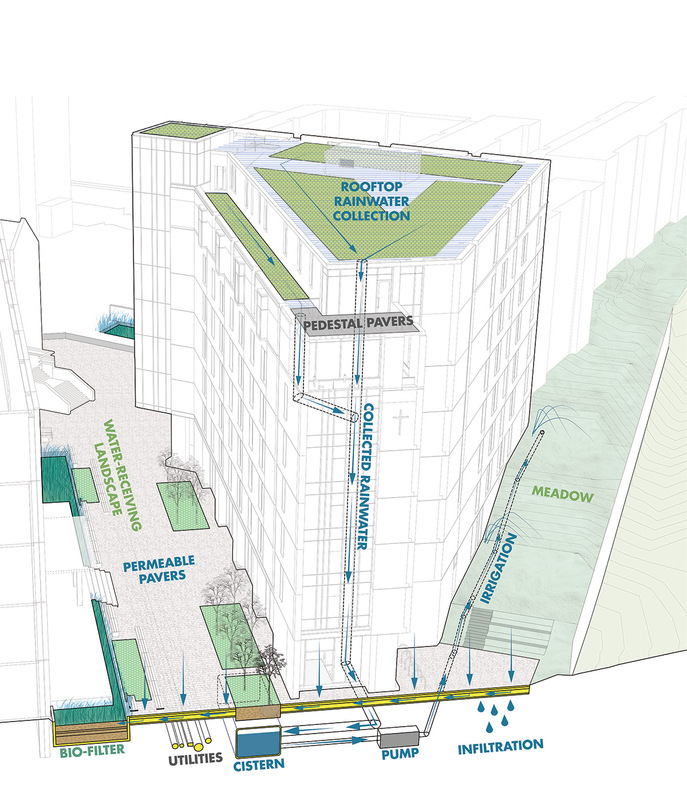 Some urban universities have also initiated creative ways to leverage their collected stormwater to offset potable water used for irrigation or circulation in cooling towers. 1. Building resilience to localized flooding requires systems thinking. The default approach of designing a campus landscape as a series of “donuts” around building projects misses the opportunity to think holistically about the urban systems at work on a campus. We work with universities to reposition the landscape of a campus as the identity-giving, social fabric of the place, while also layering in environmental and resilience benefits. At Virginia Tech, for example, we worked with the university and a civil engineering team to develop an integrated campus-wide strategy for stormwater management including the idea of creating a green spine, connecting the ceremonial heart of campus, called the Drillfield, to a restored ecological corridor along Stroubles Creek. One design recommendation is to daylight a buried portion of Stroubles Creek –restoring the waterway to better manage stormwater, improve water quality, and provide both habitat and recreational benefit. 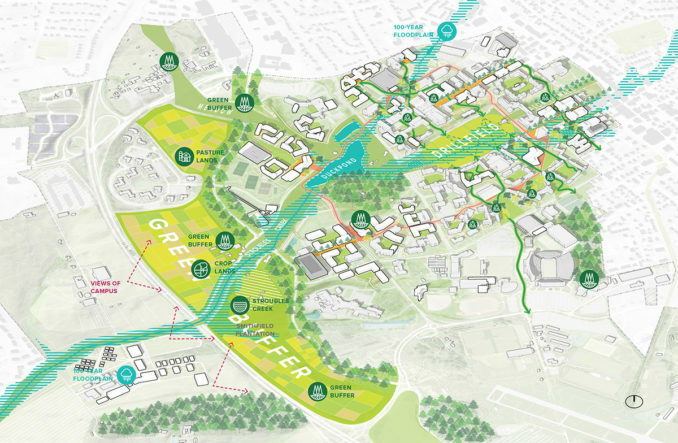 The investment in this green spine along with other measures will allow the university to manage its stormwater within a holistic system—instead of implementing a series of small one-off infiltration ponds—while also improving campus connectivity and experience. Sasaki’s landscape framework for the Virginia Tech Master Plan. 2. Successful stormwater management requires new approaches maintenance. All stormwater best management practices (BMPs) require some level of ongoing maintenance to keep them functioning. Pervious pavers require vacuuming to keep them from clogging (and consequentially becoming impervious) and maintaining rain gardens requires some specialized training of grounds staff in caring for a more diverse palette of native plants. However, institutions can typically expect lower frequency maintenance over the long-run with these new approaches over the frequent maintenance required to mow large lawns or care for non-native plantings. At the onset of a project, universities should allocate funds not only for the installation but also for the adaptation of existing maintenance plans to make sure BMPs operate efficiently and successfully over the long-term. This is an investment: when new maintenance requirements are weighed against the staff hours allocated to maintain traditional landscapes, total investment over a full year typically remains comparable, while achieving more environmentally sound solutions that deliver an ecological return over time. 3. Stormwater landscapes don’t have to look fuzzy and unkempt. There are many stormwater BMPs that can be applied in urban conditions to both accommodate heavy pedestrian and vehicular use and slow and treat stormwater before it is released off-site. Although filtration through plant material or soil is often the most effective method for improving water quality, storage in underground tanks or cisterns is another helpful approach in constrained urban contexts. They have little or no visual impact and still allow water to be reused for irrigation, or to be released slowly over time to reduce peak discharge rates. At Georgetown University’s Pedro Arrupe, S.J. Hall, which opened in August of 2016, our design team found that employing underground storage tanks—which can hold 10,000 gallons of water collected from the building’s green roof system—could offset much of the demand on the potable water system for irrigation while having no visual impact on the landscape. Integrated stormwater capture and reuse system at Georgetown University’s Pedro Arrupe, S.J. Hall, opened 2016. 4. Testing and employing stormwater BMPs is part of being a good neighbor. 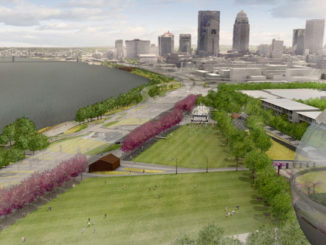 Many urban universities are concerned not only about minimizing flooding on their own campuses but also about being good neighbors to surrounding communities; they are conscious of minimizing their impact on those downstream in the watershed. We saw this firsthand as we drew up our master plan for Tulane University in New Orleans, which sits on slightly higher ground relative to surrounding, flood-prone neighborhoods. The Sasaki team worked with the University to incorporate stormwater storage and treatment concepts in future landscape projects. Other factors are also at play in New Orleans, where a new regulatory environment will soon give rise to a tax on all stormwater piped off-site. Given its land holdings and topographic situation, Tulane has the opportunity to introduce best practices in stormwater management that can have a real impact on reducing flooding in the city. 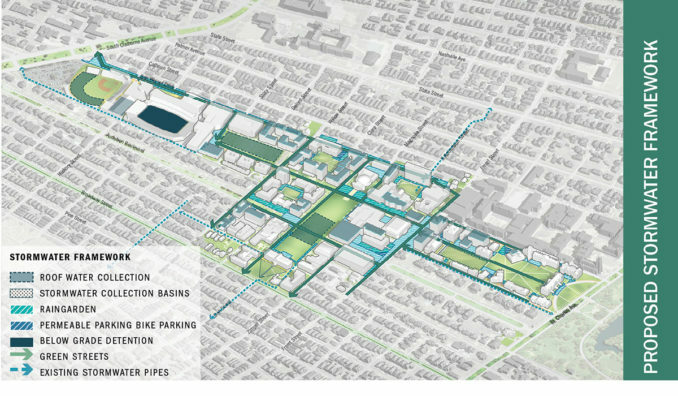 A campus-wide stormwater management plan for Tulane University will significantly reduce the amount of run-off the campus sends downstream. 5. Simple, creative modifications to traditional infrastructure can provide big stormwater benefits. Sometimes the simplest changes can be most effective when it comes to stormwater management. In our design for the Cedar Rapids Iowa Medical District Campus 10th Street streetscape, we proposed and implemented a simple modification to a standard city detail of a storm structure inlet. 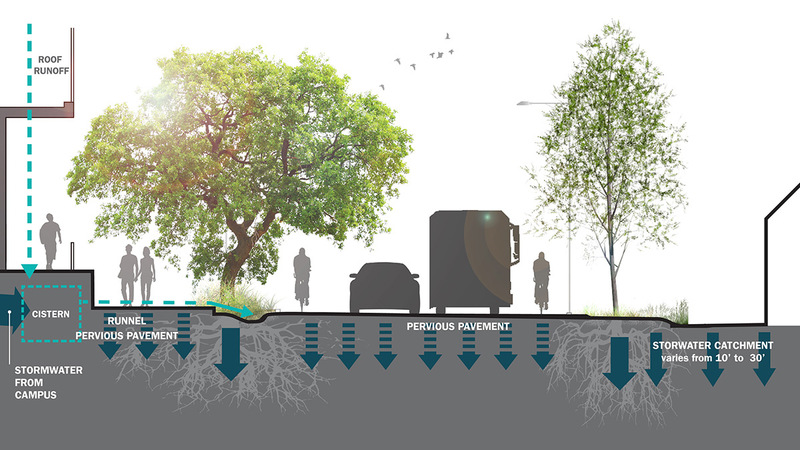 This design removed road pollution from the first flush of rainfall and redirected stormwater to irrigate the adjacent street trees, with only excess water flowing into the traditional storm drain system. 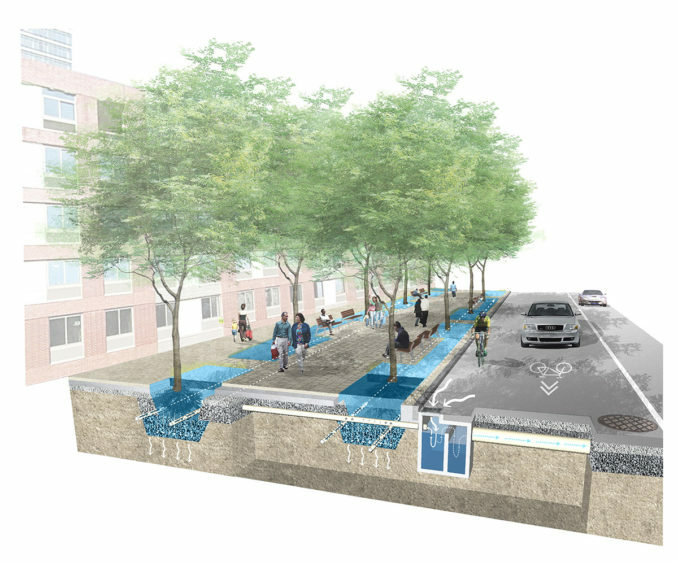 Taken altogether, this design reduced peak stormwater runoff, improved water quality, and reduced the demand for potable water for irrigation of the streetscape. Because we worked with existing city standard detail rather than introducing a new, complicated or expensive alternate system, implementation was achievable. By infiltrating the water through the soil of native plantings that are tolerant to urban conditions, this system ultimately improved the city’s ecological health and is a great example of a creative and easy-to-implement solution. A simple adaptation to the city standard detail of the storm structure inlet in flood-prone Cedar Rapids, Iowa allowed for the irrigation of street trees and the slowing of stormwater entering the traditional system. As designers and planners, we have an obligation to find ways—large and small—to help cities and institutions manage stormwater effectively for a more resilient future. 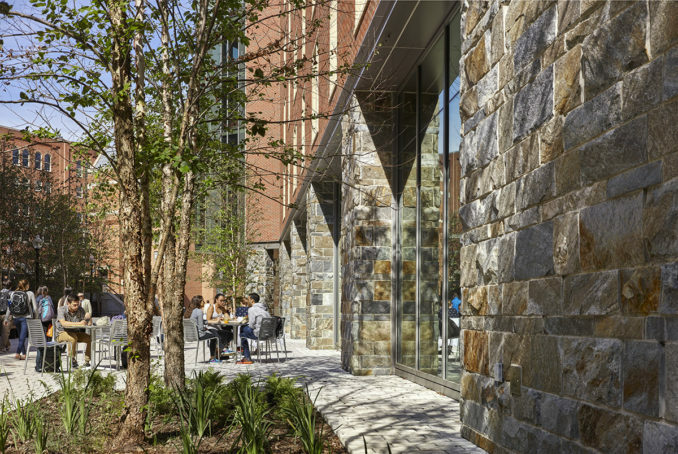 By treating and leveraging runoff on-site, universities are well-poised to demonstrate leadership in their communities and with their peers to make a measurable positive impact on their urban environments.